Crew 175, the MDRS Supaero Crew is composed of six students and one young graduate from ISAE-Supaero, a leading French Aerospace Engineering school in France. Arthur Lillo and Louis Maller, former Crew 164 members gathered a team of people with complementary skills among the students of the school, most of whom had supported the MDRS 164 effort. Together, we worked on many and varied experiments in Technologies, Human Factors, Earth Sciences and Astronomy in the Mars Desert Research Station that we helped keep in a good shape. Many of the experiments we had prepared prior to coming to the station, and we also had many other tasks to carry out on site. During the entire simulation, we used a balloon that just uses the difference of density of the air to fly. The sun’s rays heat the balloon and the air inside gets hotter than outside. It is a really simple technology with advantages like a very light mass, small volume and no external energy needed. We took the balloon out four times. The first and third times were quite successful as the balloon flew perfectly. The second flight went really bad though the wind was only around 12km/h. The balloon tore apart and we immediately put it back in its box. For the last flight we changed the camera position and intended to leave the balloon out for 24 hours. We eventually removed the camera and later on, the platform broke and the balloon flew away. Our main observation is that the balloon doesn’t resist the wind. We got some data and videos and can say that the balloon is a good idea. It can replace a drone to study the atmosphere. 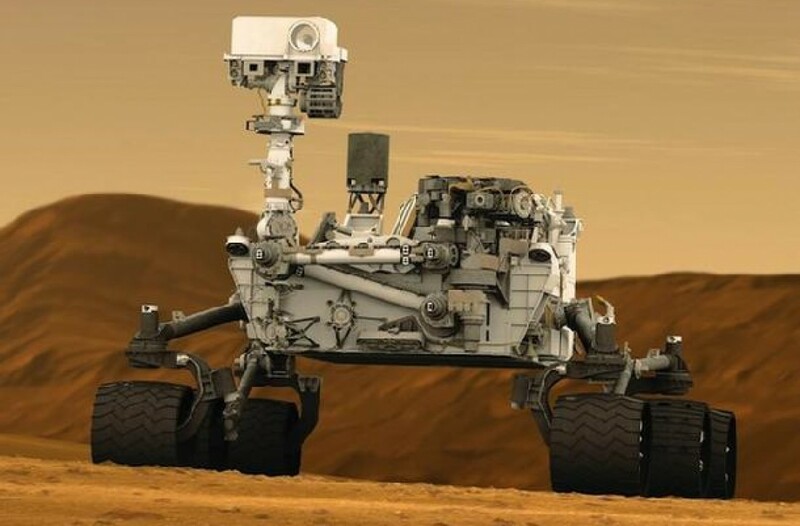 It could be used with spectrometer to study the ground, with water radars or even to calculate the dust amount in Mars’ atmosphere which could be important to plan EVAs. The deployment of the Martian seismometer and acquisition system was quite laborious, because of the gloves and the spacesuit weight, which really reduces the precision of movement. The fog in the helmets also damages precision. Regarding data collection, we could do it without any problem. However, the weather influenced the acquisition, because the sensor has moved several times, though slightly. We were unfortunately limited in the depth of our acquisition zone, because it was difficult to dig manually, especially with the spacesuit’s weight, which is an additional difficulty. The data collected is coherent in terms of spectrum of the measures, which is quite satisfying. Further analysis would be needed, but the main goal of the experiment – deployment of the material by astronauts – was met with success. This is the third Supaero crew to take with us the Optinvent glasses. This year we had the new ORA-2 version. We were able to use movements of the glasses in order to take voice recordings and pictures. Movement detection works, but there are few movements available, and a compromise must be found between the ease to trigger the action in the spacesuit, and the fact that it could be accidentally done. We used the AirDroid App in order to monitor the glasses from inside the Hab, as long as they were in range of the Hab. We were able to see from inside what the astronaut was seeing, screenshot these pictures, and download files from the glasses. This was particularly useful for the engineering check results. We failed to implement control of the glasses from a phone on the arm through Bluetooth, because of software problems. But this solution should be ready in the future, when we should be using in an optimized manner the different means of control (motion detection, touchscreen, vocal control, eye tracking). All applications use Bluetooth or local networks, no need for an internet connection. The new generation of glasses are lighter, easier to use, with good visibility and battery life. As this technology matures, it will probably be implemented on actual EVA helmets, maybe as a heads-up display, but with significant resemblance to what we are doing with the glasses. The sextant experiment conducted by Arthur was developed to help astronauts find their position, given that it is impossible to use a magnetic compass on Mars and there is not likely to be a GNSS constellation around the planet at the beginning of its manned exploration. The material needed was a marine sextant, a color map, a notebook and pen. Arthur uses the sextant horizontally to measure two angles of sight between three reference points in the landscape. The position of the point must be known accurately on the map. After the measurement, Arthur notes the two angular values and the points associated on the notebook. Inside the Hab, using geometry, it is easy to find the position of the astronauts on the map. We took the sextant during every EVA Arthur took part in. Doing measurements on the seismometer spot, we obtained precision of two to three meters, which is better than the usual 5-meter accuracy of the GPS. The most valuable lesson of this experiment is that the sextant was very ergonomic in the spacesuit: it has no lens so one can use it at 20 cm of his eye; the moving part is easy to handle with gloves and the angular dial is readable even through helmet fog. The experiment was a success, since the sextant is handy in spacesuit and we were able to find our location afterward with a high accuracy. It seems possible for future Mars explorers to use this navigation method. This experiment provided us with an easy way to monitor the bacterial pollution of our drinking water. Water can stay for many days in our different tanks, thus bacteria can grow in there. The Aquapad system was developed by the CNES (French space agency) and is currently used aboard the ISS by French astronaut Thomas Pesquet. It is composed of spaceproof Petri dishes, syringes and a tablet application for picture analysis and recording. At the beginning, we took three samples: tap water, water from the jug water filter and from the electric kettle. The bacteria grew on the agar media and showed up as red dots behind the sealed glass. We then took pictures of the bacterial colonies with the tablet and the application counted the red dots. Unsurprisingly, there was no difference between tap and filtered water (the jug water filter removes many common impurities but cannot cope with microbes). The Aquapad results were that the water could be considered healthy. The real difference was between these two waters and the boiled one: there was not one red dot in the third Petri dish, which proves that all the bacteria had been killed in the process. When looking at the results of our study, it seems that the bacterial pollution remained roughly constant during the whole mission. It was a very simple and quick way to monitor such a critical matter, and could be generalized to non-space applications. Victoria brought an autonomous vegetable garden created by a French start-up called Vegidair. She installed this Vegidair in the living room of the Hab so everyone could see it and our new vegetables. When we opened the Vegidair after the long trip from Earth to Mars, we discovered it was cracked. We fixed it with sealant. Victoria planted some lettuces and some roquettes. and decided to plant the same seeds, with the same fertilizer, in the same pots and put this in the GreenHab to compare the growth between a natural way and with the Vegidair system. We really believe that it had a positive psychological effect on the team to see our fresh food growing in the Hab. Victoria is leaving her little Vegidair here for the next crews. and hopes they will take care of it and enjoy the fresh lettuces and roquettes it will produce. Physical activities have been done through a particular training made with Cyril Vieu, responsible of the physical trainings at INSEP (Institut National du Sport, de l’Expertise et de la Performance) and with Frederic Bouriat, physiotherapist and member of the AKEF (Association des Kinésithérapeutes des Equipes de France). At the beginning, I was supposed to do this training alone but my crew kindly proposed to join me for the entire simulation. The training is quite simple, made of three sessions each week composed by the same simple exercises. This activity had a very positive impact on the health of the crew each day. It forced us to wake up early and was a moment where everybody was together. To make the planning, I followed some rules I had set up before reaching the station, respecting rest days and taking EVAs into account. Everybody has progressed during the three weeks. Sunday of the second week was the only day we didn’t do the physical training because everybody was really tired and needed to rest. It took Mouadh some time to get used to the astronomy and astrophotography instruments, but he finally managed to take some great pictures of the sky. He believes the guides written by Peter are crystal clear. Unfortunately, the weather conditions were not favorable half of time, but he could make 8 observations in total, which is more than was expected. He discovered an entire universe, and now definitely wants to know more. Objects viewed: Orion Nebulae, Betelgeuse, Jupiter (and moons), Sirius, Andromeda Galaxy, Saturn (and moons), Moon, Mars, Venus, Pleiades. As we had a “full-time journalist” this year, Louis Mangin, only one person managed every type of communication. We tried to focus on making daily journalist report as accessible and detailed as possible, written both in French and in English, with eye-catching pictures, to allow our relatives to share it easily, to gain notoriety, to spread through social medias and discussions. We received a lot of attention from French media. We also worked hard on a rotation video, which is not finished yet. We tried to build a wide quality photo bank, with panoramic views, aerial pictures from the balloon, to be able to reuse it for communication purposes for the year to come, also to gain interest from a wider public. Accidents happen in everyday life on Earth, and usually require assistance. This might be a simple sprain, a temporary fatigue or worse, a loss of consciousness. When these critical situations happen, the very first minutes after the incident can be lifesaving. The same can naturally occur on Mars. The Sol 14 EVA (#13) was then dedicated to these procedures that can save lives. After a short briefing given by Simon and Xavier to our three buddies (Louis Maller, Mouâdh and Arthur) on the lower deck, we carried out the following exercises before the Hab: bringing the patient to sitting position, recovery position, on his back and finally carrying him on the rear of the Rover. After taking photos and debriefing the different procedures, Xavier and Simon are currently writing an illustrated report summing up the results and the conclusions from this EVA. During the simulation, we had a survey brought to us by Michigan State University and NASA. It was a personal survey each member filled in with questions about how we feel about our personal interactions within the crew, mission support and “Earth” but also about how we perceive ourselves. This survey helped us reconsider what we did or how we felt each day. Each time, we did it in the evening, after dinner. It took us approximately thirty minutes each time and we needed to be really focused. Occasionally, some of us could not filled it, exhausted by a long and busy day. We all think that this study will give a lot of data about how a crew like ours currently works. It could be very interesting as our crew is composed of people knowing each other well. The results will probably be far from more classic crews and might answer important questions about team strategies. Victoria’s second goal was to take care of the GreenHab. Every day she went two or three times in the GreenHab tending to the plants. She noted the temperatures and the humidity rates in the tunnel and in the GreenHab. She watered twice a day and when she harvested a lettuce or some radishes she planted new ones. The next crews will have several nice lettuces in the Hab and in the GreenHab. When we arrived at MDRS, backpacks #2 and #3 weren’t working. Xavier took care of this and fixed them up. About #2, it was simply the ground wire of the charger connector (inside the backpack) which was loose and had to be reconnected. Concerning #3, the electrical joint linking the wire from the external switch and the one to the battery was broken. Therefore, the battery was fully charged but we weren’t able to switch it on. In the end, we had 6 working backpacks (out of 6). – The printing plate itself seems damaged, its surfaced scraped. When we arrived at MDRS, 6 talkies were functional out of 9. We fixed up the 2 first non-functional talkies at Sol 6 and ended up with 8 functional radios (out of 9). We also tried to build a two-way radio relay system by using two talkies, on VOX on two different channels, but tests showed the limits of this system, which was too unstable. Since the beginning of the simulation, we’ve been experiencing power being drained from the batteries when the generator was turned off. At the end of the Sol 5 troubleshooting session, thinking that one of the two solar arrays circuit was open, we came up with the following strategy: while waiting for the solar arrays contractor to come over and try to fix this up, we’ll have kept the generator on in order to prevent batteries from being drained their power. During two days of troubleshooting (Sol 9 and 10), the generator had been running (and keeping batteries 100% charged), setting the batteries voltage high enough and the sun had been pushing the solar panels to power the batteries at an even higher voltage. These 2 reasons naturally led to shut down two thirds of the PV arrays via the PT-100 Charge Controllers. Finally, Xavier assumed that, since the PV arrays have been installed, they got through some mysterious “incidents” making them unable to hold up the batteries (even during full daylight). This forced the auto-start of the generator to turn it ON and made it run for a time period exceeding the “Max Run Time” (implemented in this generator controller). Since then, this auto-start has never worked again. Before: It allows to check that everything which will be used during the EVA is ready, and also aims to check EVA participants are correctly and safely geared up. Start: This sheet consists of all the tasks to do before the actual EVA can start: check various systems readings. As time is precious during an EVA, this procedure has been optimized so the two pairs of EVA participants can complete it in the shortest time possible. After: this sheet allows to check everything is back in its place after the EVA. Report: This last sheet gathers all the data needed to fill in the Operations Report. Xavier drew a special attention to get this document through all the crew members so he could make it as understandable, efficient and straightforward as possible. In the future, it aims to be used by every crew member, even the non-Crew Engineer. When we arrived at the MDRS, we noticed the great work that had been done covering the tunnel. The idea was to improve the feeling of immersion in simulation. Still, the tunnel was not hiding the view from the engineering airlock’s doorstep. That is why we decided to intervene. The day before the beginning of our mission, we assembled some pieces of fence in the form of a wall around the engineering airlock, prolonging the tunnel to the static tank. We covered it with a large plastic sheet and attached it with ropes and metal wire. It was our first teamwork and we were quite efficient, finishing it within a few hours. The wall held on for a dozen Sols, but finally we had to recover the plastic sheet to prevent the strong wind from tearing it apart. The fence is still in place, materializing the pressurized area. Since water is maybe the most important resource on Mars, we set a water consumption monitoring study. On a daily basis, we collected several data to compare their share in the total daily consumption. We noticed that one third of our daily consumption was gone with the flushes (2 gallons per flush) and only 10% dedicated to showers. The other measured water consumptions have been the jugs of filtered water to drink and the water used to fill the Greenhab watering can. We figured out that more than 50% was gone through food rehydration, dish washing and smaller things (teeth and hand washing, coffee and tea). The BBC came to the Hab on Monday 27th February, to complete a documentary regarding missions to Mars. They came in at 9 am, and our guest was already wearing a spacesuit. He spent the day respecting simulation rules. After a briefing, we went on EVA, and we showed him the seismology experiment, did some exploration north of the Hab on the Grey Moon site. After getting back to the Hab, we had lunch together, discussing the mission and Mars exploration. We are glad that we could carry out our science program and all the other tasks that we faced in the station, grateful for the analog environment and protocols that allow us to experiment as much as possible what it would be like on Mars. This three-week rotation was filled with interesting lessons, and allowed us to know a lot of different aspects of the station and to explore our environment, with different kinds of weather. The crew enjoyed the variety of Martian landscapes we were able to discover. Living and working together was an interesting challenge, and the crew managed to overcome it successfully, despite crewmembers having very different personalities. We were united by our desire for this mission to be a success as a crew. We experienced the need for some rest days after the first two-weeks, which is just one example of the lessons that having three-weeks instead of two have taught us. We are very grateful to the Mars Society and MDRS Mission Support Team for having awarded us this extended rotation, that also allowed us to carry out more complex experiments, and feel the results of confinement and isolation a bit better. The crew still thinks that time flew by quite fast! We would also like to thank Mission Support for their presence, support and reactivity during our mission. Credit goes to our crowdfunding donors, Colas, the Mars Society, Association Planète Mars (French chapter of the Mars Society), our university ISAE-SUPAERO, the ISAE-SUPAERO Foundation, Staneo, Optinvent, Vegidair, ISAE-SUPAERO Space Systems Laboratory, CNES and VittaSciences, for having supported this mission, making it possible for our crew to join the MDRS 2016-2017 season. We also thank all the experts that have helped us prepare our various experiments during this mission. We are hoping that next season will see another crew of Supaero space engineers take part in the MDRS adventure!